Hopin' the Turks are wise to a possible false flag? Because the US will engage in that tactic if it benefits them. Hell they'll entirely fabricate an incident if it serves them. The most recent 'chemical attack' in Syria, comes to mind. I highly doubt anything at all occurred. Hubby was reading the news this morning and said “it sure looks as if the US is hoping to get a reaction from Turkey” He even mentioned the very scenario Michael Hanna mentions in the Time article which is why I chose that specific article for this post We are witnessing what was the planned for progression of all that’s been on going in this area- Turkey and the US have not really been allies- more like frenemies- for quite, quite some time. “The collision course is coming. It’s already come in some respects and it’s a question of how badly this deteriorates,” says Michael Hanna, a senior fellow at the New York-based Century Foundation. “There are U.S. personnel on the ground. In the worst case scenario you’re having Turkey, a NATO ally, a close traditional partner of the United States, could kill American personnel on the ground,” he tells TIME. Exactly what the US wants. Real or claimed. Doesn't matter. No questioning of why the US is occupying Syria? No questioning as to why the US is supporting terrorists who attack Turkey? Odd behaviour for a "close traditional partner" to Turkey? A claimed NATO ally, to Turkey? Photos appeared on line of US personnel in deep with terrorists- Not that the US really cares about that! 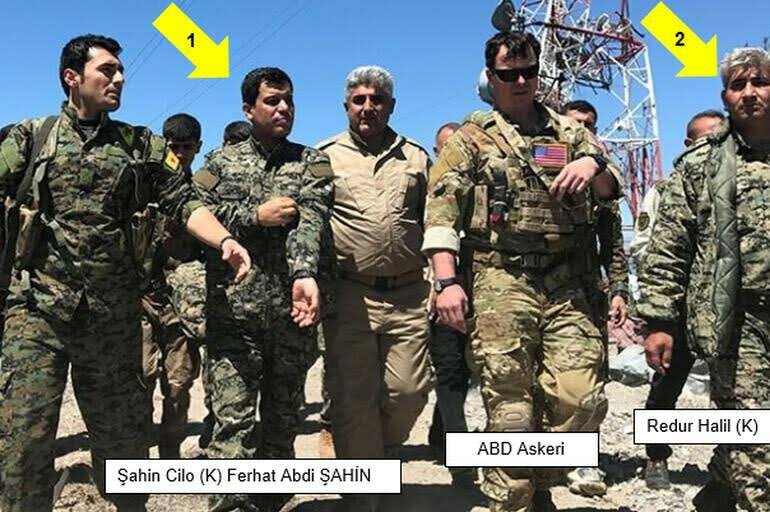 #BREAKING US commander visited Syria's Derik yesterday was accompanied by PKK's armed wing HPG commander Şahin Cilo (1). Questions that should be asked, but aren't? Why is it that the US has always embedded itself with terrorists? Zbigniew Brzesinski and his “few stirred up moslems” in Afghanistan. Operation Cyclone- Arming and creating AQ. Not remarkable in the least- But why doesn't the media ask why this is the case? Over and over? It all happens right out in the open, for goodness sakes! Never mind the whining about time allowed! Why is the US involved with terrorists again and again and again! US Tanks Roll Onto Northern Syria border to Confront Turkish allies in favour of terrorists who are destroying Syria with an eye to destroying Turkey! US armoured vehicles were deployed in areas in northern Syria along the tense border with Turkey, a few days after a Turkish airstrike that killed 20 US-backed Kurdish fighters. Questions that should be asked but aren't being asked! 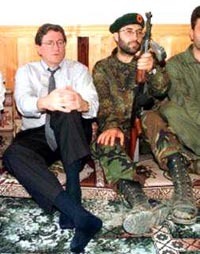 2- Why are they embedded with terrorists? Again? 3- Why, are they betraying their claimed ally of decades- Turkey? 4- Turkey's right to defend itself isn't being mentioned at all. Why? 5- What's the point of the US led NATO alliance when the US is openly courting and bedding Turkey's enemy? 6 - If your NATO allies aren’t really your allies what the hell is the point of NATO at all? As a Canadian that’s a question I ask myself! How come these questions aren’t being asked by the media? I've mentioned repeatedly this was going to be the case- Readers here will recall me stating this was the plan on a number of occasions. This will not be the no fly zone Turkey wanted- Turkey's no fly zone envisioned no PKK. The YPG/PKK will attack Turkey from the safety of a US guarded zone. While a member of NATO, Turkey is not part of the U.S.-led coalition fighting the Islamic State in Syria and Iraq. Ankara launched its own offensive against the jihadists in August, known as Operation Euphrates Shield, but it had the dual goal of pushing back both ISIS and YPG forces from its shared border with Syria. In March, Ankara claimed it had successfully wrapped up Euphrates Shield. The US rejected Turkey's numerous offers to help. The PKK terror group's Syrian wing the People's Defense Forces (YPG) on Thursday attacked the Turkish military with mortar and missile fire from the Syrian border town of Tal Abyad. A mortar round landed on a tank stationed near a military outpost located between the Turkish districts of Suruç and Akçakale, facing the Syrian districts of Kobani and Tal Abyad across the border. No damage or injuries were reported on the Turkish side. Turkish units stationed in the area responded with artillery and tank fire. Later on the same day, military sources stated that YPG terrorists had attacked 11 Turkish border stations 13 times. The Turkish military retaliated in kind immediately to the attacks, the sources added. Following Turkey's airstrikes against PKK-affiliated groups, including the YPG in northern Iraq's Sinjar and northern Syria's Karachok towns on Tuesday, YPG militants targeted Turkish military outposts on the border with Syria in southern Hatay and southeastern Mardin provinces a day later. Turkish security forces, for the first time have seized a surface-to-air missile launcher that was in the PKK's possession, providing clear evidence of the organization's expanding arsenal. The METIS M1, used for firing anti-tank missiles and surface-to-air missiles, was found in counterterror operations against the PKK in southeastern Turkey in February. Later, images of the weapon along with anti-tank missiles and a large number of munitions were shown to the press. 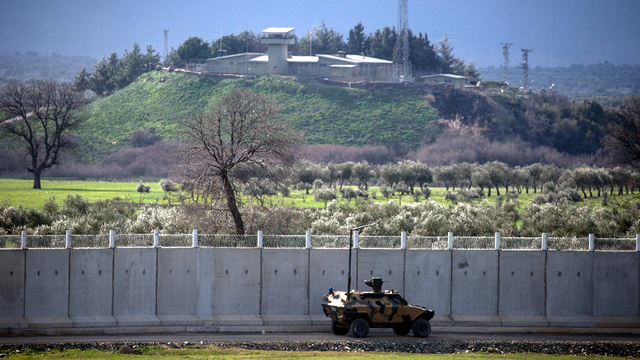 "American troops have been patrolling with their Kurdish allies near the Syrian-Turkish border"
And there is the wall that Turkey built to keep the US backed thugs out of their country. And defend their state. You know, the wall the disinfo alt media never mentions in order to push the agenda on behalf of the globalist remake of the middle east to the benefit of Israel? Turkey's ongoing negotiations with Russia to purchase the S-400 surface-to-air missile systems is likely to be concluded in an upcoming meeting between President Recep Tayyip Erdoğan and his Russian counterpart Vladimir Putin, scheduled to take place in Russian Black Sea coastal city Sochi on May 3. Commenting on the issue Foreign Minister Mevlüt Çavuşoğlu said Friday that Russia and Turkey reached an agreement regarding the purchase of the S-400 air defense systems, and negotiations on the price are underway. "We agreed in principle with Russia on the S-400 purchases. The negotiations on the joint production and prices are underway," he said. Turkey and Russia have engaged in talks regarding Turkey's cooperation with Russia in the defense sector since the Russian-Turkish rapprochement in August 2016. However, the negotiations to purchase the S-400 missile system gained momentum in recent weeks. However, Defense Minister Fikri Işık recently clarified that Turkey will use the Russian systems without integration, noting, "Russia's S-400 missile systems will not be integrated into the NATO system." Işık said on March 15. On the other hand, Turkey's efforts to develop its indigenous long-range air missile defense system will continue, even after the procurement of Russian S-400s. "We [Turkey] have already developed short-range ballistic missile 'Hisar' and are currently working on a medium-range missile project. Developments of our own long-range defense system are ongoing and we will be able to produce these systems within the next five to seven years," he said. You asked why the US is always embedded with terrorists. That is a fundamental question. Syrian President Bashar al Assad, in his April 21, 2017 interview, which I linked to in my latest post, addressed that question vis a vis Syria. He was asked how to get the US out of Syria, where it has appeared militarily (uninvited as per usual). He responded that the way to get the US out was to defeat the terrorists...then (presumably) the US would not have an excuse to be in Syria...and they would have no proxies to hid behind. He did insinuate that, if after getting rid of the terrorists, the US refused to leave, Syria would have no other recourse but to confront them directly. Turkey should take a page out of Assad's book and get rid of all the terrorists, including the Israeli proxies (aka the Kurds) and then there would (theoretically) be "peace in the valley". Villagers under Ansar al-Islam's control were subjected to harsh sharia laws; musical instruments were destroyed and singing forbidden. The only school for girls in the area was destroyed, and all pictures of women removed from merchandise labels." And this claim of these persons being secular is just over the top, stinking filthy lying. Kaz said something in the previous post that is correct- people don't want truth- not most of them- they want lies that fight their world view. "they want lies that FIT their world view"
In my humble opinion , Its easier to form an alliance with Serbia than it is with Iran and/or Syria. NATO published a map in 2006 showing a partitioned Turkey for the sake of a Greater Kurdistan -- a so-called "New Middle East". The Turks are not stupid and the "Great Dumbass Zionist Satrapy of North America" is about to be taught a lesson back in the Old World. Do they not see the patterns? And this implication that the US is really fighting ISIS- who in the hell actually believes that is true? One would have to be a real dullard to believe that! Of all the patterns I see the only clear pattern that emerges above the noise is one of regional depopulation. They create, equip, and fund pretty much all of the regional terrorist franchises and the end result is always the same... the local indigenous populations are either forced to flee from their lands or alternatively are held hostage by these same terrorists while their cities and homes are then literally bombed into ruins. This task is performed by participating nations and terrorist organizations alike. If the Mosul (Tigris) and Tabqa (Euphrates) dams collapse and finish the job of washing away the remains of the towns and cities along these river valleys one would be left with a blank slate to start over with. I don't even think the locals would even want to return if they could after experiencing so much pain for so long. Could depopulation actually be the plan? And if so for who?... certainly all of this mayhem is not for the benefit of the Kurds. "Of all the patterns I see the only clear pattern that emerges above the noise is one of regional depopulation"
Yup, I've stated that on many an occasion- you must be new? It's a remake of the entire region..
On the Syrian livemap there seems to be a number of tweets which are suggesting that the western part of the YPG areas are now also being patrolled by russian troops, that the russians are going to build 2 bases there and that they are hosting the syrian government flags in YPG held teritory. It was the support of Iran, to circumvent the US imposed sanction, that resulted in the arrest of the trader and the Turkish banker in the US. Trade is done between peoples, not governments. The guy who was shot down, was found guilty by the Iranian court for spreading propaganda. Iran is a nation which it is not what it seems. Luckily Brendon O'Connell finally got that and he made a video about it. It is 27:05 minutes long. I strongly recommend to watch the whole thing there is a small silly bit in the beginning but its serious for the rest of it. Both Iraq and Iran support the PKK in Sinjar quite openly. Iran supporters the PKK everywhere. Both Syria, Iran and Iraq condemned Turkeys air strikes which were to the benefit of all of them. Can you believe that?! They are digging their own graves. "President Erdogan : "We are aganist a State in North Syria, Syria must not be splited"
I'm not sure why your asking if that is fake news? I don't think the US is trying to bait Turkey or manufacture an incident, although that wouldn't be beyond them. The US has already killed Turkish troops and turkey has killed US troops, we agreed on this in November. IMO the US doesn't have the stomach for a war with Turkey, I agree that a lot of groundwork is being laid for a war, but ultimately the US only fights very weak enemies, who can't defend themselves. Such a conflict would have enormous proportions, and could easily get out of hand. 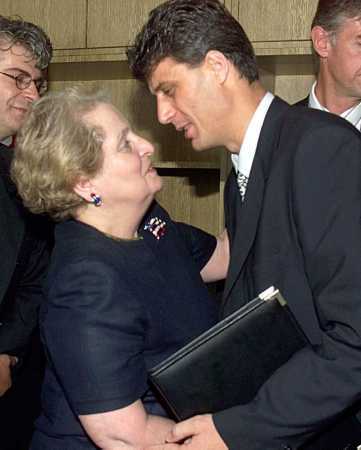 That said, Zionist interests comes before anything else. What the US engaged in was an act of provocation against Turkey. The US had known weeks in advance what Turkey was going to do, their FM confirmed this. They then used the incident to get even more control over the PKK, as you know the PKK entertain relations with everyone. They prepared the noflyzone4Rojava stunt, which included obscene anti-Turkish memes and paraded around with the PKK in show of 'support'. Note they did not react military to Turkeys attack, because they can't, and won't, risk a bigger conflict that could jeopardise the gains they've made in Syria. Let's all remember that the US is in a landlocked territory with the PKK, surrounded by hostile forces, their position is precarious IMO. No, I had not seen that, thank you. There has been so many propaganda piece in the media. What annoys me most is that the MSM refers to the PKK as "Kurds" & still calls Turkey a vital NATO ally, and claim that the US is balancing their relationship between Turkey and the PKK -- they are not. When I say the US won't attack Turkey, I do so out of the assumption that, that would be a stupid move to make for the US. This path to greater Kurdistan is the worst one for the US. The reason it has come to this, is because the US has played their cards wrong and committed countless of mistakes inside Turkey. They have put themselves against the wall where they can either attack Turkey, or shelve their plans. Clearly the MSM campaign against Turkey is intended to portray the country as such a rogue nation that the US simply has to rein it in. Regardless, the US can't actually submit Turkey the way they did Iraq, Turkey is an army nation. That might not exclude that psychopaths inside the Pentagon sees things differently. Everyone should note that Turkey is now the only meaningful opponent of US policy in Syria besides Assad. Russia has totally caved, they are a weak and pathetic imitation of the US. Now they are openly advocating and arranging the partition of Syria with NFZ's. They should just leave Syria as they have been exposed and humiliated. Also note, that every time there is this conflict between the US & Turkey, Russia sides with NATO. One would think Russia's main interest would be to sow discord in NATO, but apparently not when Zionist interests are at stake.